What are the biggest challenges when it comes to personalization? When it comes to customer experience (UX), personalization is an important part of increasing engagement. Using data to inform content and digital ads can aid in the creation of experiences that are highly relevant, as well as different from that offered by competing brands. Not only can personalization enable marketers to hold the attention of their targeted audience, but it can also, ultimately, inspire brand loyalty. Despite personalization being a vital aspect of UX, many marketers (59%) are failing to personalize content at scale, with time being cited as the biggest barrier to doing so. 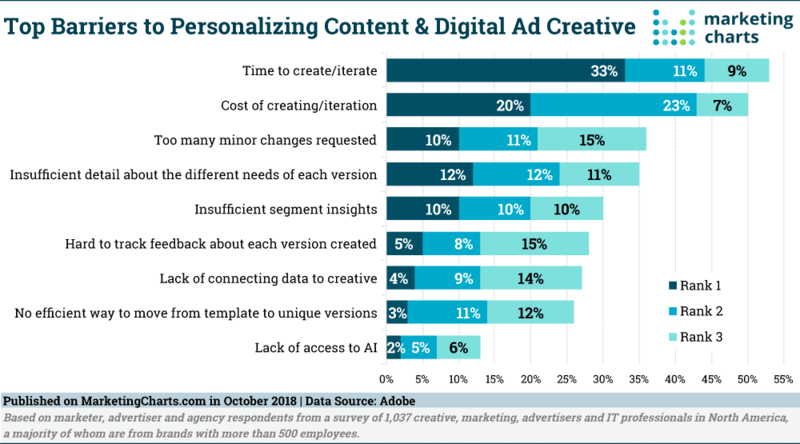 Adobe’s new survey has revealed that under half of respondents would say their company’s personalization is extensive, meaning they are failing to reap the benefits that it offers. One-third (33%) of respondents highlighted time as being the biggest obstacle when it comes to personalizing content and digital ad creative. It was also highlighted by many as being the second (11%) or third (9%) barrier to personalization. And it’s no wonder that time causes so many issues, as the survey also revealed that, on average, it takes 17 hours to create a personalized ad or piece of short-form content. The biggest reason behind this fairly large timeframe is that many variations are required for a single piece of personalized content. Variations need to be created for different social platforms, segments, campaigns, etc. This can mean it takes an average of 12 days to launch a single piece of content that targets each variable. A further finding from the study revealed that less than a one-third of respondents would say that delivery and content creation are coordinated well, which could be further adding to time issues when it comes to personalization. This finding follows on from a study from Wrike that revealed that creatives are struggling with a number of challenges when it comes to collaboration.